a) Only I, II and III are true. b) Only II is true. c) Only I and II are true. d) Only I and either II or IV are true. e) All I, II, III and IV are true. a) Only either II or III is true. b) Only IV and either I or III are true. c) Only IV is true. d) Only II is true. e) Only III is true. a) Only II is true. b) Only I and III are true. d) Only II and IV are true. e) Only I and II are true. a) Only I is true. c) Only III is true. e) Only I and IV are true. Directions (6 – 10): Study the following letter/number /symbol sequence and answer the questions following it. 6. How many symbols are there in the series which are immediately preceded by a number and immediately followed by a letter? 7. How many symbols are there in the series which are immediately preceded by a number and immediately followed by a letter? 8. If the position of the first and the sixteenth elements, the second and the seventeenth elements, and so on up to the eleventh and the twenty-sixth elements, are interchanged, which letter/number/ symbol will be seventh to the right of nineteenth letter/number/symbol from the right? 9. If the positions of the letters in the sequence are reoccupied by the letters themselves though after getting rearranged alphabetically from the left, which of the following will indicate the position of L in the new arrangement? 10. What is the total number of ‘the numbers immediately followed by a letter’ and ‘the symbols immediately following the letters’ together in the above sequence? 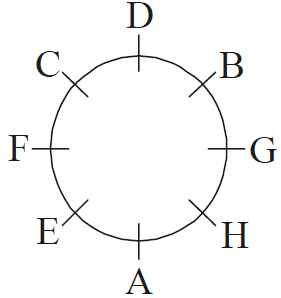 A, B, C, D, E, F, G and H are sitting around a circle facing to the centre. 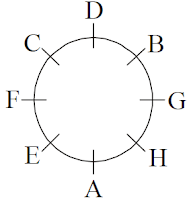 D is second to the left of F and third to the right of H. A is second to the right of F and the immediate neighbour of H. C is second to the right of B and F is third to the right of B. G is not an immediate neighbour of F.
11. How many of them are there between H and C? 12. Who is to the immediate left of A? 13. In which of the following pairs is the first person sitting to the immediate left of the second person ? 14. Who is fourth to the right of B ? 15. What is E's position with respect to G?